If you browse the Apple Music app this morning, you’ll notice it has quietly added a pre-save mechanic for upcoming albums. Except they are not called pre-saves; they’re termed “pre-adds”. You do, however, have to do a little bit of digging to find it. Tap on the “Browse” tab and scroll down – all the way through “Best of the Week”, “Playlists”, “Music Video Playlists”, “Hot Songs”, “New Releases” and “Videos” – and you’ll find a new category entitled “Coming Soon”. 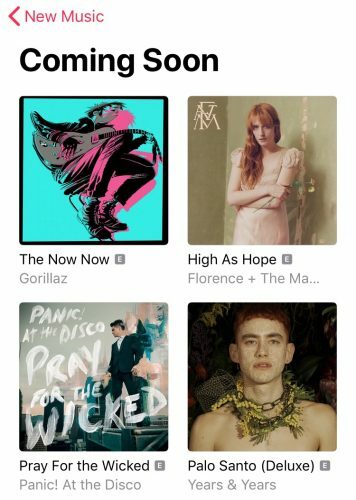 Among the highlighted albums are The Now Now by Gorillaz (due on 29th June), High As Hope by Florence + The Machine (ditto), Pray For The Wicked by Panic! At The Disco (due 22nd June) and Palo Santo by Years & Years (due 6th July). 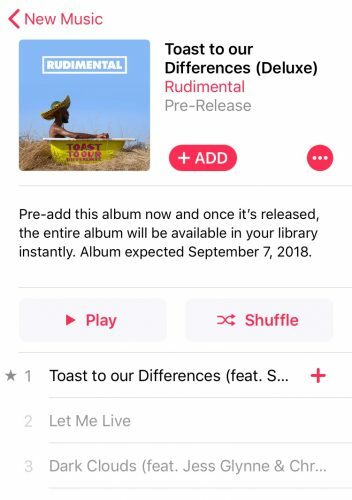 While the bulk of listed albums are due in the next few months, there is a pre-add option for Rudimental’s Toast To Our Differences, which is not due until 7th September. “Pre-add this album now and once it’s released, the entire album will be available in your library instantly,” runs the blurb on Apple Music. What is most interesting about this all is that the pre-save – sorry, the pre-add – happens entirely in-app and has been developed by Apple itself. Pre-saves on Spotify are now common practice in marketing, but any pre-save tool has to be developed externally using the Spotify API. Music Ally has spoken to several marketers over the past year or so who, expressing varying levels of frustration, argued that the development costs associated with building a pre-save mechanic on Spotify are currently high and that means only the biggest labels and biggest acts can afford to do it as routine. At the moment, it appears that the pre-add albums on Apple Music are ones picked by Apple’s own editors – so it is not open to all. At the time of writing, only 11 albums have been singled out by the service for pre-adds, but we can expect this to grow. It is unclear if this is merely a quiet testing of the technology – as we say above, you really have to dig around to find it – and it will eventually be made more prominent. But even looking at the artist page for those involved in the initial wave of pre-adds, there is no immediate indication that this functionality is available for their upcoming releases. For Gorillaz, for example, The Now Now is listed at the top of their page under “Latest Release” but you have to tap on the album sleeve itself to even see there is a pre-save option. Music Ally approached Apple for a comment on this and what the future expansion plans are. If/when they get back to us, we will update this story. 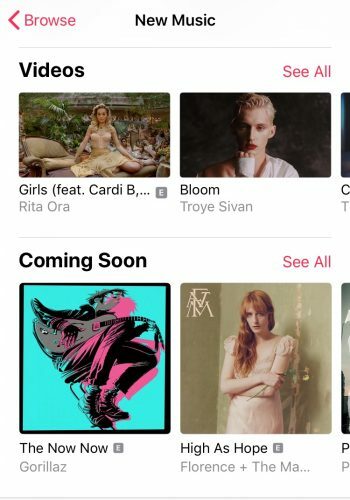 Apple Music launching pre-adds should, however, not come as a surprise: late last year Apple in the UK hired David Emery, who was involved in the first Spotify pre-save campaign in March 2017 for Laura Marling’s Semper Femina album in his previous job at Kobalt.